The winter season can bring in beautiful snowy scenery; however, with the cold comes dangers as well. This can especially be true when it comes to your concrete driveway. While it is very durable, it can suffer by taking in ice, sleet, snow, and slush for a duration of time. And for those who live in Middle Tennessee, you know that the ice can be very unforgiving. If you’re faced with the decision to repair or replace your driveway after a heavy winter storm has come through, you need to be aware of the following signs to determine what steps you need to take next. Knowing how severe the damage to your concrete driveway is requires understanding what a damaged driveway actually looks like. The most obvious warning sign is cracks, either large or small, running across the surface of your driveway. These cracks can expand and deepen if you have previously used chemicals to melt the snow off your driveway. Cracks can also deepen from having water from the melted snow seep into its existing fractures. When the temperatures drop and the water freezes up again, the ice expands, widening the crack even further. Metal snow shovels can also create damage to your driveway by dislodging loose asphalt if you’re not careful. The other common driveway imperfection to be aware of is sunken areas or divots. If the subgrade wasn’t properly prepared, the concrete will not have proper support and will be prone to sinking. Without proper support and the presence of thick snow/ice, it is easy for even durable concrete to give way to divots. It is important to remember that each case is different and should be approached differently. However, there is a basic rule of thumb to follow that cracks or divots over 2 inches deep are better off being replaced, while lesser imperfections could be remedied with a resurfacing. You will also need to take your driveway’s age into consideration. Age can be the largest determining factor of how susceptible it is to damage and should always be taken into account when assessing damages sustained not just from the winter season. 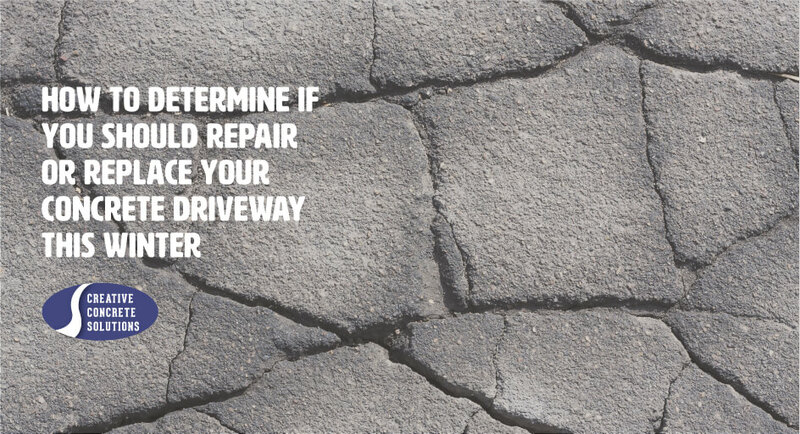 Younger driveways that are already cracking will most likely continue to split, as they probably were not installed properly and need to be inspected for repair immediately. The bottom line is that it can be tough to decide whether it is best to resurface your concrete or to go all in and replace it. While there are basic signs and guidelines for you to take note of, it is always better to have an experienced and trusted opinion on the matter. While certain imperfections and damages can be seen plain as day, there might be some greater source of the problem that you can’t see on the surface. Regardless of what you decide, having it done will be incredibly beneficial so that you are ready throughout any season. If you are in the Middle Tennessee area and need a professional opinion on the state of your concrete driveway, contact Creative Concrete Solutions today to schedule an inspection and learn your best course of action.